Plans to redesign Coalville’s Marlborough Square have been temporarily put on hold to ensure that the price for the work reflects value for money. North West Leicestershire District Council’s (NWLDC) public realm project was due to start earlier this month, but the cost received from contractors is over the estimate and the allocated budget. Work has now paused while the scheme is reviewed. Discussions are now underway between NWLDC, Leicestershire County Council (LCC) and the LCC approved contractors. Work is ongoing to resolve the cost issue quickly and it is anticipated that work on site could start later in the year or in early 2019. Fencing currently at site will be temporarily removed opening up the one hour free car parking spaces in the square to shoppers and short stay visitors. The 24 replacement free spaces that have been split between James Street Car Park and Margaret Street will also continue to be free. 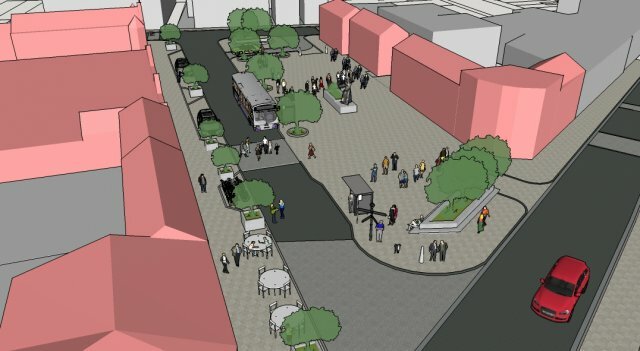 An approved budget of £1.5 million has been committed by NWLDC for the redesign, which plans to create a more attractive public space that is pedestrian friendly and can be used for a range of events. It was hoped that work could start in earnest this month, however the higher than anticipated cost means this has not been possible. Councillor Richard Blunt, Leader of NWLDC, said: “Coalville is one of our corporate priorities and Marlborough Square has been in the pipeline for some time, so it’s disappointing to put it on hold. However, we have a duty to our taxpayers to ensure we are get the best deal on our projects and stay within our budgets. We need to cut our coat according to our cloth. The redesign has previously received support from businesses, residents and local councillors.